Finding a match for customer samples on the first try is critical to customer satisfaction and retention, while saving time and cost for the paint retailer. And storing custom paint recipes for repeat customers improves productivity even more. This versatile non-contact spectrophotometer allows for paint color matching on just about any customer sample, even patterned, textured, large, or bulky items. With switchable aperture size of 6mm and 12mm, the MatchRite iVue offers the smallest measurement size in color matching. With ColorDesigner PLUS formulation software, the MatchRite iVue is a powerful tool for servicing your customers in the retail paint market. Available as a bundled, turnkey solution including computer, monitor, label printer, software and measurement instrument. Discounts are applied to bundled solution versus purchase of individual products. Fast, easy measurement on any sample, even odd-shaped or large bulky items to quickly get to an accurate paint formulation on the first try. Reduces waste and rework. Unique Active Visual Targeting™ ensures precision measurements by targeting the exact spot to be measured. Non-contact spectrophotometer measures 1.5 inches from the sample surface, keeping lenses clean, free of wet paint, and reduces service costs over the life of the instrument. Weekly calibration improves in-store uptime and improves the customer experience. 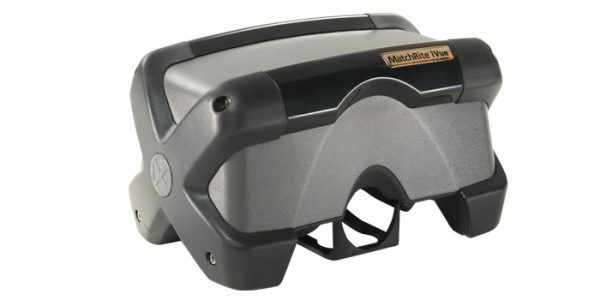 The MatchRite iVue is based on an innovative LED spectral engine that delivers superior color matches, especially with reds, blues and dark colors. Its LED illumination will provide years of uninterrupted service and repeatable performance, making it the ultimate investment for ensuring in-store productivity and high levels of customer satisfaction. MatchRite iVue can be integrated with paint dispensers, shaker, software and equipment as a single, fully functional solution.